Our Crocodile mystery last week showed some crocodile tears, but the exciting part is just below our sad reptile. 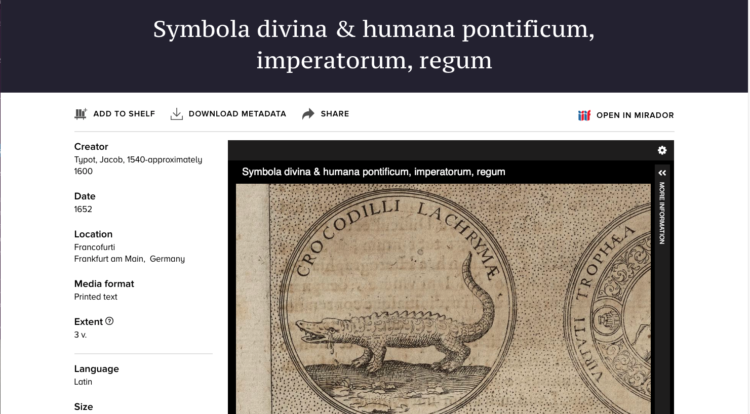 This illustrated Italian ducal motto is from Symbola divina & Humana pontificum, imperatorum, regum, by Jacob Typot (Frankfurt, 1652)—and you can get up close to the image in the new Miranda platform. 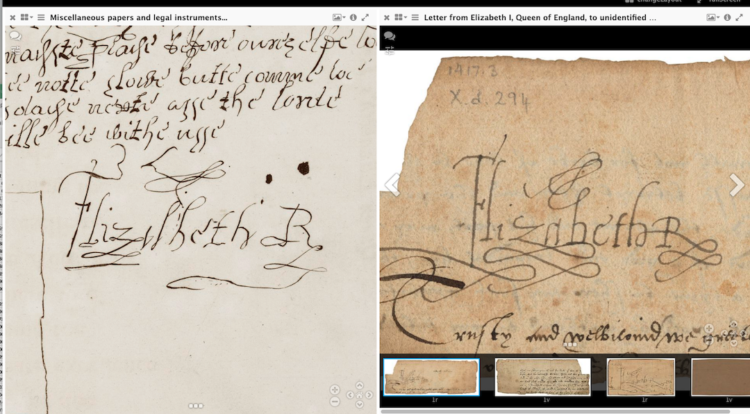 Those who study early modern materials—images, books, and manuscripts—often want to get a closer look at our digital images. The rapid growth of available images at a number of libraries and special collections also offers the chance to compare copies of a particular work, or different works within a genre or from the same producer. To make it easier to examine and compare images, the Folger has become a founding member of the International Image Interoperability Framework (IIIF) Consortium, a community of libraries, museums, companies, and image repositories that aims to provide easy access to high quality image resources. Miranda uses the IIIF standards to let you explore our digital images in a variety of new ways. The viewer embedded in the site itself, a tool called “Universal Viewer,” allows you to zoom and rotate images. As the icons from the mystery post suggested, you can also download the images, or get code to embed them in your blog. Being able to rotate images can be very helpful, particularly when an item might have writing in several directions, like this forgery by William Henry Ireland. 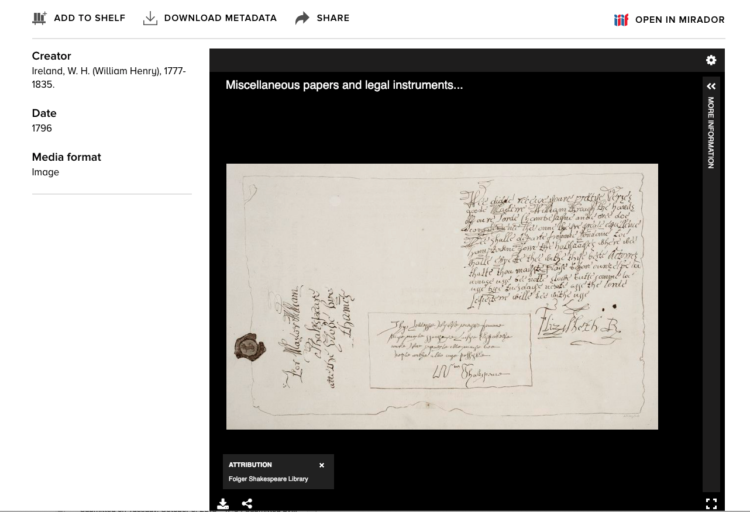 Each institution that uses IIIF publishes information about the image (a “manifest”) that lets others know where to find the image files, as well as info like page labels, the sequence of images, and some description. The institutions also make their images available via the IIIF image API: a set of rules that allow different types of software to access the images in the same way. By providing explicit instructions in how to find the image and display it, a viewer at Stanford or the Bodleian can display images from the Folger without having to download or host them themselves. If you go to Miranda, you’ll also see a link to Mirador, a tool that specializes in comparison. This button will let you load the image into the Mirador viewer, which provides an easy means for comparing multiple options. Thus if you wanted to compare the faked signature from Ireland’s forgery with the real deal, you can! To recreate this view, you’ll need to open each item in Mirador using the “Open in Mirador” button on the page in Miranda. Once in Mirador, click on the “Metadata Tooltip”: an i in a circle. This will open a panel that includes a link to the manifest for that object. Copy the link to the manifest for your first item, then go to the Mirador window for the comparison item. Click the button that looks like four squares: this is your Change Layout tooltip. You’ll get a number of options. Select whether to add your comparison image to the left or right by clicking “AddSlotLeft” or “AddSlotRight.” In your new open slot, click “Add Item.” At the top right, you’ll see a place to put in your Manifest URL, labeled “addNewObject.” You can continue adding items to compare by adding additional slots to your viewer. For a detailed explanation of the many things Mirador can do, see this post by Ben Albritton. Take a poke around Miranda, check out our digital images through the embedded Universal Viewer, and try out our items in Mirador. Let us know what you think! Meaghan J. Brown is the Folger’s Digital Production Editor. In addition to project-herding for the Folger, she's also the managing editor for Papers of the Bibliographical Society of America.